A few weeks ago the Dean of Guildford and I gave a joint talk – a colloquium – which explored the subject of ‘Spirit of Place’ in buildings of faith. 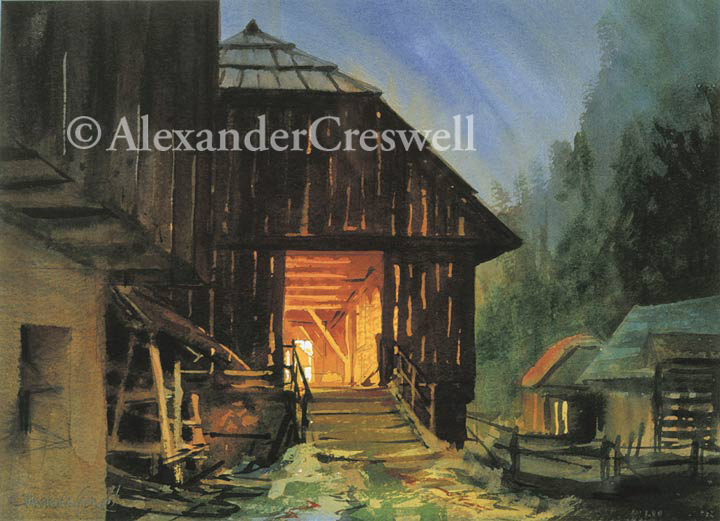 One of the images which found its way into the slideshow was this little watercolour of a group of humble farm buildings in Slovenia. It seemed rather out of context in a presentation mainly about monumental cathedrals, mosques and temples – the stoney hallelujahs which punctuate the history of civilisation. With the approach of Christmas, though, this image seemed to allude gently to the real origin of the jangling season of goodwill and frantic shopping. The image of a simple cattle-shed at dusk, a warm light emanating through its open door and the gaps between the weatherboarding suggests the way in which we should consider the Christian nativity; with simple humility for a commonplace occurrence which had been elevated to become the most important event in the Christian faith. This humble birth would of course also be responsible for the creation of many of the great edifices of faith which we had been discussing that evening and which constitutes a large part of my subject matter in painting architecture through the decades. The painting reminded the Dean of the Adoration of the Shepherds by Rembrandt, an intimate painting in which the holy family is shown in a womblike pool of light within a barn surrounded by massive enveloping darkness and old beams. I understood what he meant, and these farm buildings took on a more elevated feel. The farm is nestled in woods in the Slovenian mountains, in the Triglav National Park near the border with Austria. I had been there in the autumn of 1998, as a guest on HRH The Prince of Wales’s tour of the region. I was invited to accompany the Prince with the purpose of seeing and recording glimpses of the busy trip which he might have missed. It had been a frantic exercise in speed sketching, dressed in a suit. At the end of this particular day the royal entourage had descended on this peaceful place, with a posse of security men, officials, police, photographers, and curious locals. I had sketched the little farm rapidly in the fading light and I hung back to finish the drawing as the circus left, anxious not to be left behind when the motorcade revved up. Sometimes such sketches, hastily gathered, yield a rich harvest of information. I had not drawn the flock of people who had swarmed over the farm – had I been a caricaturist I would have had a field-day. Instead I grasped at the gentle nature of the place, deserted, silent. There is an enigma in the inviting warm glow from within, a hint of life. I would have liked to have stayed as darkness and silence fell.